Mayor Bill de Blasio has repeatedly voiced his frustration with his fellow Democrat, Gov. Andrew Cuomo, who he says has worked with Senate Republicans in the state Legislature to stymie his agenda and major progressive legislation. In an interview with Harry Siegel of the Daily News late last month, the mayor said Cuomo could have “done a lot more to avert” the “divided government in Albany,” where Democrats control the Assembly and Republicans the Senate. The mayor’s comments come as his allies face two investigations for improper fundraising in efforts to win the Senate for Democrats in 2014 and after a legislative session during which Cuomo worked with Senate Republicans to pass a budget containing a $15 minimum wage phase-in and a comprehensive paid family leave program. Cuomo and the Legislature also allocate hundreds of millions of dollars each year to fund de Blasio’s signature pre-kindergarten program. And yet, de Blasio’s sentiments are not unique, many Democrats feel Cuomo has empowered Senate Republicans in order to prevent the passage of a full slate of progressive legislation that could in theory alienate his moderate and conservative backers, including those upstate, on Long Island, and in New York City. The mayor and Assembly Democrats have a fairly long list of specific policy and funding grievances. By pointing to California, de Blasio offered up a measuring stick. At first glance it would appear that California and New York are neck-and-neck on progressive issues. Both states have passed marriage equality, a $15 minimum wage plan, and paid family leave. But progressive critics of the governor say he has failed to fully go to bat on reforms that would actually change how state government works, modernize voting and elections, and advance immigration and criminal justice policies opposed by conservatives. California has implemented a variety of these policies since 2010. Cuomo allies say criticism the governor faces on these issues is unfair and comes mainly from the sharp edge of success - that critics say because he achieved some major policy victories he should achieve them all, while also winning the Senate for Democrats. The de Blasio administration failed to respond to multiple inquiries about which specific policies California has enacted that he feels New York should emulate, but a number of his allies and political experts say California is in fact far ahead of New York on a number of progressive issues. These include immigration reforms like the DREAM Act and drivers’ licenses for undocumented immigrants; criminal justice reform measures like providing college education for inmates and laws to address holding police accountable for the deaths of civilians; and election reforms like independent redistricting and open primaries. Meanwhile, in New York, Cuomo has enacted what many progressive analysts see as austerity measures, such as strictly limiting agency spending and instituting a property tax cap for municipalities, something California Governor Jerry Brown has moved away from. The Cuomo administration declined to comment for this article without the de Blasio administration listing which policies from California the mayor wants to see in New York. 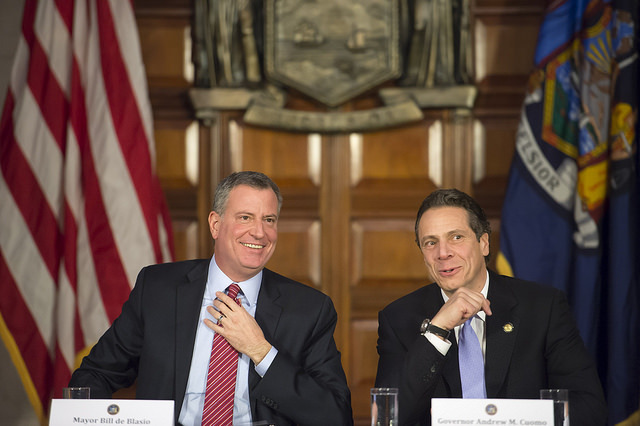 Even beyond de Blasio, Cuomo’s relationship with progressive Democrats remains complicated. He’s had well-publicized roller coaster relationships with the Working Families Party and with the Legislature’s Black, Puerto Rican, Hispanic and Asian Caucus. Administration officials point out that the governor has backed the DREAM Act and various criminal justice measures that are in place in California only to have Senate Republicans reject them. But de Blasio’s point to Siegel and that of many other Democrats is that Cuomo has ensured Senate Republicans are in the position to block those bills. “I think a lot of the governor’s proposals are holograms so that he can come downstate and say ‘I suggested college for inmates,’ but he can also go upstate and say ‘I listened to your concerns and the bill didn’t pass,’” said Dr. Christina Greer, professor of political science at Fordham University. Bill Samuels, head of EffectiveNY, longtime Democratic fundraiser and Cuomo critic, said that the governor has repeatedly failed to help Democrats win the state Senate and by doing so is responsible for failed progressive policies. Cuomo’s deal with the Legislature also included a promise that the Legislature would vote to amend the constitution to allow an independent commission to draw districts starting in 2020. California put redistricting of state-level seats in the hands of a citizens redistricting commission after a proposition vote in 2008. In 2010, Californians approved a proposition tasking the commission with drawing congressional districts. Senate Republicans continue to use de Blasio as a boogeyman in their quest to hold their control of the Senate. “Allowing these New York City radicals to have unchecked power over our entire state, especially in light of the U.S. Attorney and Manhattan D.A. 's investigations into the fundraising scandal they hatched two years ago, would be a disaster for the hardworking taxpayers and families who call New York home,” Senate Republican spokesman Scott Reif told Politico New York for a Tuesday article about de Blasio’s distance from this year’s Senate contests. Democrats are hoping to swing the chamber by riding Hillary Clinton’s voter turnout coattails and many are eager to see how involved Cuomo gets. Karthick Ramakrishnan, professor and associate dean at University of California Riverside, told Gotham Gazette that Gov. Brown spent his early years in office playing a fiscal conservative and threatening and delivering vetoes of bills he felt weren’t fiscally responsible. But as the economy has flourished Brown has welcomed more progressive legislation. Ramakrishnan said there is no doubt that a host of progressive legislation has passed California’s Legislature since Democrats won a supermajority in both houses in 2012 - major immigration and electoral reforms put the state far ahead of New York in those areas from a progressive standpoint - but he notes that there were other factors at play besides party control. Gov. Brown has made it clear that he has no higher political ambitions, he will be term-limited out of office when his current term ends, Ramakrishnan said. Cuomo, however, has no term limits and announced he plans to run for a third term; is active in national politics; and believed by many close to him to still have ambitions for the White House. “Brown has declared he has no further political ambition so there is not much tension between him and other Democrats,” Ramakrishnan said, noting that de Blasio might also hold broader political ambitions that may have irked Cuomo. The situation sounds similar to Albany’s budget process where leaders trade on a host of issues and in some cases give away the chance to vote on major legislation to make sure they achieve top priorities in the budget. Having Senate Republicans on his side on certain issues during negotiations has helped Cuomo stop the Assembly’s push for progressive legislation that he does not support. Another major factor Ramakrishnan points to in California’s progressive surge is changing demographics across the state. Ramakrishnan said a number of safe Republican districts saw an influx of immigrants and Democratic voters over the last decade. Senate Democrats have long touted demographic changes on Long Island as the key to what they see as their inevitable takeover of the chamber. Democrats recently won the Long Island seat formerly held by Republican Sen. Dean Skelos for two decades. Although Skelos’ corruption conviction likely played a major role in swaying voters, Democrats say a victory there might not have been possible if the demographics there hadn’t been trending Democratic for years. Finally, Californians have the ability to put major issues before voters through ballot propositions, thereby bypassing the Legislature, which can take much longer to process an issue. Asked if he supported a full Democratic takeover of the Senate on Tuesday, Cuomo told reporters that it is “too early for any political conversation about that," instead indicating he is focused on Clinton and the upcoming Democratic National Convention that he is attending, and may be speaking at. Elections determining control of the state Senate are four months away - the same day as Clinton’s likely face-off with Republican Donald Trump. This year New York passed a 12-month paid family leave program that has been praised as the most “generous” in the nation. The program won’t be fully phased in until 2021. California passed its six-week paid family leave program in 2002 and it went into operation in 2004. Cuomo touted his support for the DREAM Act, a program that would give undocumented students access to college tuition aid, during campaign stops in the city and made it part of his State of the State agenda, but he has said very little about it when the Legislature is in session and made no dramatic public push for the bill. Senate Republicans have made blocking the DREAM Act a major part of their reelection campaigns. Brown signed California’s Dream Act into law in October of 2011. Since then he has signed a series of major immigration reform bills. In 2013 Brown signed a bill that allowed undocumented immigrants to apply for drivers’ licenses. The last time a New York Governor pushed for drivers’ licenses for undocumented immigrants was in 2007, under former Gov. Eliot Spitzer. The backlash against the proposal from conservatives and even Democrats was so strong that Spitzer dropped the plan. This year Brown signed a bill that allows undocumented immigrants to buy health care on the state exchange created under the Affordable Care Act - making California the first state to offer that kind of coverage. New York offers undocumented immigrants emergency Medicaid and coverage for end-stage cancer and renal disease. “I think it's very hard for the Governor to go into these economically depressed areas upstate and tell them he supports a bill to help immigrants that they see as undermining their already very tenuous way of life,” said Dr. Greer, of Fordham. Sen. Gustavo Rivera, a Bronx Democrat, said that the first step for New York to achieve what California has on immigration reform would be for Democrats to take control of the Senate. But it wouldn’t end there. “We would also have to move conservative Democrats on these issues, we’d have to move the needle,” Rivera said, adding that he thinks Senate Democrats could move the DREAM Act during a first year in the majority, but acknowledged it isn’t a sure thing. The two states appeared to be locked in a race to get to $15 per hour this year as both Brown and Cuomo pushed for a minimum wage increase - the governors signed their bills on the same day, April 4. But the bills are not equal: both call for incremental increases to the wage until finally reaching $15 - in California it will be 2022 before the wage is fully implemented; in New York it depends on where you live. Residents of New York City will have a $15 minimum wage by the end of 2018; Long Island and Westchester reach $15 to start 2022; while the rest of the state will reach $12.50 by the last day of 2020, with a 2019 panel to review the economic impact and able to halt the increase. California adopted a new primary system in 2012 that allows the top two vote getters in primary races to move on the general election regardless of party affiliation. That move in combination with California’s citizen redistricting commission has opened up seats once kept in a stranglehold by incumbents. Good government groups have pushed New York City to adopt nonpartisan primaries but there has yet to be significant movement. The idea is a nonstarter at the state level. In October of last year, Brown signed an automatic voter registration bill that would have citizens registered to vote during visits to the DMV for drivers’ licenses or ID cards. Cuomo proposed a similar initiative in February during his State of the State speech, but met with opposition from Democratic lawmakers who worried registration would favor suburban and rural areas of the state where there are move drivers. Assemblymember Brian Kavanagh, a Manhattan Democrat, suggested empowering other agencies to also register voters to create parity. Cuomo called for a review of the criminal justice system in the wake of the July 2014 death of Eric Garner during an NYPD stop. That review did not come about in the Legislature. Instead of passing legislation to create a special prosecutor to review police killings of unarmed civilians Cuomo issued an executive order empowering Attorney General Eric Schneiderman to take such cases out of the hands of the local district attorney. Cuomo’s move was hailed by advocates who say local DAs are biased and unwilling to prosecute members of their local police force. But many advocates are still pushing for a similar system to be made law as executive orders can be undone. Senate Republicans have refused to consider any number of criminal justice initiatives Cuomo has proposed, including raising the age of adult criminal responsibility from 16 to 18 (New York is one of only two states where it is 16, with North Carolina). California does not have a special prosecutor system in place for police killings of civilians but last year Brown signed a law banning the use of grand juries in such cases. The move came in response to outcry that a grand jury refused to indict NYPD officer Daniel Pantaleo for Garner’s death. "The use of the criminal grand jury process, and the refusal to indict as occurred in Ferguson and other communities of color, has fostered an atmosphere of suspicion that threatens to compromise our justice system," state Sen. Holly Mitchell, a Democrat from Los Angeles who sponsored the bill, said in a statement at the time. Cuomo has tried and failed to get the Republican state Senate to act on college for inmates, something California expanded in 2015 in a partnership with a number of community colleges. Cuomo instead put forward a privately financed plan this year. Brown currently supports a ballot initiative that will come before voters this fall that is designed to reduce recidivism and revise how it is decided if youth are tried as adults. While Brown has been considered more fiscally conservative than some of his allies in the Legislature, he did sponsor a 2012 ballot proposition that raised taxes on high-income earners. His initiative merged two other ballot initiatives - including one from the California teachers union branded a “millionaire’s tax” that would have increased the personal income tax on those earning $1 million and more. Brown’s plan created four new upper-income brackets for those making $250,000, $300,000, $500,000 and $1,000,000. The new tax rates are supposed to last seven years. The plan also increased the state sales tax. A group of unions recently introduced a new proposition that would make the tax increases of Brown’s proposition permanent. New York adopted a millionaire’s tax under Democratic Gov. David Paterson in 2009 that Cuomo partially renewed in 2011. It is now set to expire in 2017. Many unions have pushed to extend the tax as has the state Assembly. Cuomo has fought back against any tax increases. De Blasio insisted his universal pre-k plan be funded by a New York City income tax hike on households earning more than a million dollars a year. Cuomo delivered the cash for the plan and not the tax - something de Blasio publicly lamented.